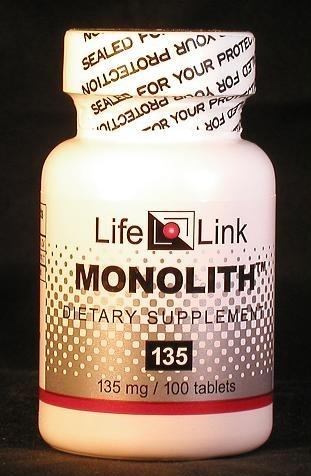 Monolith: A source of lithium — the lightweight element with heavyweight applications. Lithium orotate is a mineral salt that is normally found in small amounts in all living things. Other lithium salts have been used for more than a century to treat mania. During the past few decades lithium therapy has become one of the mainstays in the treatment of ‘bipolar disorder’ (manic-depression). A number of lab studies have kindled interest in the use of lithium for treating Alzheimer’s and other neurodegenerative diseases. preventing symptoms of Fragile X Syndrome. The therapeutic dose of lithium orotate (150 mg/day or less) is much lower than that of the other lithium salts. Lithium orotate was introduced as a supplement by Dr. Hans Nieper, the innovative German physician, who used it to treat depression, headaches, migraine, epilepsy, and alcoholism. Nieper considered orotates to be superior to carbonates, chlorides, sulfates, and other negative-charged ions as bioavailability enhancers for minerals like lithium. Accordingly, we will limit our discussion of lithium orotate to a brief summary of relevant research, and let you draw your own conclusions about what medical conditions it may be effective in treating. In a 2004 review of the subject, D.M. Chuang of the (U.S.) National Institutes of Health wrote: “The neuroprotective and neurotrophic actions of lithium have profound clinical implications. In addition to its present use in bipolar patients, lithium could be used to treat acute brain injuries such as stroke and chronic progressive neurodegenerative diseases.”6 Examples of such diseases are Alzheimer’s, Huntington’s, ALS, Parkinson’s, and other less well-known conditions. Lithium carbonate and lithium citrate (the salts of lithium that have been traditionally used to treat bipolar disorder) have a poor toxicity profile — they show toxic effects at dosages only a little higher than the medically effective dose. ‘Bipolar’ patients, who usually use high doses of lithium carbonate (typically above 900 mg/day) must therefore receive professional guidance and testing for side effects. Although the lally-gaggers who control the world’s clinical research programs have yet to conduct a clinical trial of lithium as a prevention or treatment for Alzheimer’s or for any other neurodegenerative disorder, we needn’t wait for them to get their act together. Lithium orotate is available as a nutritional supplement. Are lithium orotate supplements useful for the conditions and purposes mentioned above? We aren’t allowed to tell you, so you should take a look at some of the references cited here, and then decide for yourself.